This information pertains to App Inventor 1 (Classic). For information about the new version of App Inventor, go to the App Inventor 2 Library. Get a brief overview of App Inventor. Set up your computer. Set up your Android device or run the emulator. Build your first app. These easy-to-follow guides will help you build apps and learn about different components in App Inventor. Look up how specific components and blocks work. Read about concepts in App Inventor, like displaying lists and accessing images and sounds. Learn to use some of the tools built into app inventor to make your development process faster, and to find and correct bugs more easily. 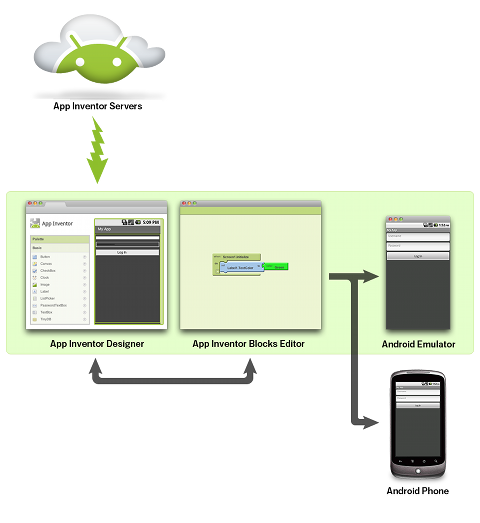 Learn how to package and share apps that you have built using MIT App Inventor for your Android device (phone or tablet). Read through common questions and answers about using App Inventor. Find solutions for common problems. Creating an App Inventor app begins in your browser, where you design how the app will look. Then, like fitting together puzzle pieces, you set your app's behavior. All the while, through a live connection between your computer and your phone, your app appears on your phone. You can build many different types of apps with App Inventor. Often people begin by building games like MoleMash or games that let you draw funny pictures on your friend's faces. You can even make use of the phone's sensors to move a ball through a maze based on tilting the phone. But app building is not limited to simple games. You can also build apps that inform and educate. You can create a quiz app to help you and your classmates study for a test. With Android's text-to-speech capabilities, you can even have the phone ask the questions aloud. To use App Inventor, you do not need to be a professional developer. This is because instead of writing code, you visually design the way the app looks and use blocks to specify the app's behavior.